Surrounded by thickly forested mountains andsituated at the confluence of the Khan and Mekong Rivers, Luang Prabang has a tranquil, old worldcharm rarely found in Asia today. This fascinatingtown was the capital of the Lane Xang (millionelephants) kingdom until the mid-sixteenth century, and in colonial times it served as a provincialheadquarters of the north. We visit Heritage House, situated on the point of thepeninsular it was classified in the World HeritageList in 1995 by UNESCO. Run by a team of mainlyLaotian people, Heritage House was reconstructedby specialized architects (particularly French). From here we continue to Vat Siphouthabat – a monkschool where guests have the opportunity to meetwith young monks learning about Buddhism.Our next stop is at LuangPrabang’s NationalMuseum, formerly the Royal Palace and still hometo a collection of personal artifacts of the formerLaotian Royal Family. 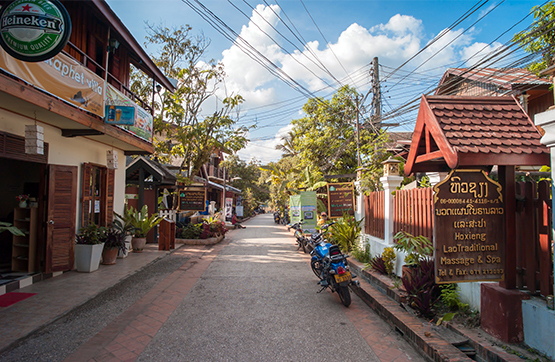 Lunch is included at a localrestaurant where traditional Lao food is served,followed by a trip to the Traditional Arts andEthnology Center. After breakfast, depart with our guide to visit the highlights of the capital. 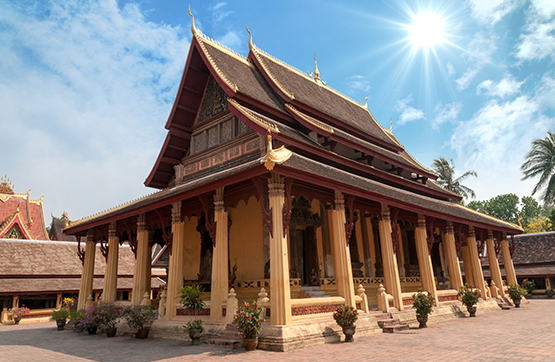 Visit Wat Sisaket, the oldeststanding temple in Vientiane. Vat Sisaket featuresover 6,000 Buddha images. Nearby is Haw PhraKaew, which contains some of the finest Buddhistsculptures and artifacts in the country. One of themost photographed images of Vientiane is Patuxai,the victory gate also known as Anousavari. Constructed in 1958, its architecture is inspiredby the Arc of Triumph in Paris.Another famous Vientiane landmark is the Phra ThatLuang stupa. King Sethtathirat built this great sacredstupa, considered the national symbol, in 1566.The original stupa was said to contain relics of LordBuddha. Next take a visit to Talaat Sao (Vientiane’smorning market), which despite the name is openall day. We take time to roam through the stalls displayingeverything from Laotian woven textiles, souvenirsand fresh produce, to daily household items andimported goods from neighboring China andThailand. There is time to try some delicious localcoffee and snacks while looking around beforerelaxing at a nearby restaurant.